Motoring has its inherent risks, but if it’s a motorcycle you’re driving, the danger is magnified. For one, it doesn’t provide the structural protection that a car does. And since it has only two wheels, you will have to watch your balance aside from putting your driving skills and quick reflexes to good use. In other words, you need to be more vigilant when riding a motorcycle. Nothing will give you the kind of freedom that riding a motorbike does. A big part of the enjoyment, though, is reaching your destination in one piece. Being out on the road with fellow drivers already poses a risk, but there are ways to minimize the chances of mishaps. Taking these precautionary measures will help ensure not only your safety but also of the other people around you. Helmet. A full-face helmet is recommended. It will protect your face in case of a crash and will keep the wind from your eyes while riding. Jacket. Choose a jacket made of leather or textile that’s strong enough to resist abrasion. Quality jackets contain material that absorbs impact, protecting your back, arms and internal organs. When riding in the rain, a jacket will help keep you warm and dry. Trousers. Similar to jackets, motorcycle trousers are made of leather and textiles. The best safeguards for your knees, hips and shin are those that feature armor with CE (European Conformity) rating, the accepted standard in safety gear. Boots. Appropriate riding footwear should be sturdy, oil-resistant and gives sufficient ankle support. Your feet are very vulnerable in a crash, so pick boots with a strong, non-slip sole that prevents twisting. Gloves. Your hands are usually the first to touch the pavement in a crash. For this reason, they need maximum protection. At the very least, your gloves should be made of materials that isn’t easily damaged by friction and has kevlar stitching. It should have a snug-fitting wrist strap and fully covers your fingers, the front and back of your hands, and your wrists. Note that the gear you wear must be specially designed for motorcyclists. They’re not the kind you buy from any clothing store. In case you got involved in an accident, it’s advantageous to have competent legal services at your disposal, like what Legacy Car Accident Attorney provides. You don’t have to stress over matters like insurance and compensation. However, road safety should still be paramount when you’re riding your bike; meaning, you avoid getting injured in the first place. Most riders are required to go through a safety course for motorcycles before issuance of a license. If this is not a requirement in your country, you should still consider taking it to familiarize yourself with possible riding hazards and road rules. Better yet, proceed to a more advanced course to better hone your skills. Before you hit the road, give your motorbike a look-over. Check for leaks, as well as loose bolts and connections.Assess the different parts of your bike to make sure they are roadworthy. Make necessary adjustments to the controls so they can be easily accessed. Headlights, brake lights, and turn lights should be clean, fully functional, and clearly visible to other motorists. Tires must be in good condition, properly inflated, and free from bumps and cracks. Mirrors should be smudge-free for maximum visibility of the rear and side areas. Be prompt in observing regular maintenance schedules like brake pad and oil changes, tire replacements, and chain adjustments. If something needs to be fixed, don’t procrastinate. Professional riders manoeuvring hairpin turns with their big bikes looks easy on television, but it takes great skill to pull off this kind of stunt. Whether you’re experienced or a beginner, your motorcycle should be the one that you can handle without difficulty and suits your riding abilities. Some bikes these days are extremely powerful machines and may require special driving skills. It’s also crucial for you to be comfortable while using it. When sitting on your bike, your feet should be flat on the ground and not tiptoeing. The controls and handlebars must also be within easy reach. One small misstep can leave you skidding down the street or flying off your motorcycle. Keep your focus, especially when rounding curves. You should also watch out for loose gravel or unstable portions of the road. It’s easy to get distracted while riding. If your mobile phone rings, don’t answer it, as taking your hands off the handlebars is highly dangerous. If something catches your attention, stop your motorcycle to take a look instead of turning your head away from the road. Familiarizing yourself with a route is advisable especially if you are going on a long-distance ride. You can plan your trip in more details if you know about local speed limits, locations of motorcycle lanes, and places to stop for the night. Be informed about the weather forecast in the places included in your itinerary. Avoid riding in unfavourable weather when the roads are slippery, and there is less visibility. Besides, driving in pelting rain at fifty miles per hour without a windshield to protect you can be a very unpleasant experience. Never drink and drive is a piece of advice you hear often, but being sober while riding is more than abstaining from alcohol. Never go out on the road while you’re drowsy, angry or mentally preoccupied with something else. 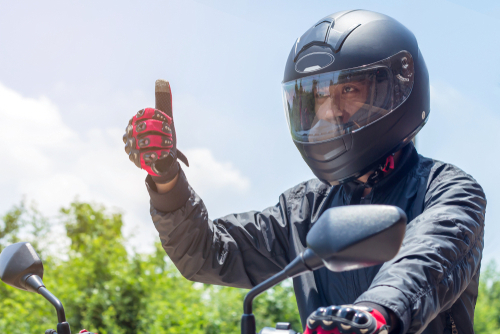 Motorcycling requires your full concentration, and distractions can make you commit mistakes that can result in accidents and serious or fatal injuries. It may be exhilarating to ride as fast as you can, but remember that speed limits are put in place for a reason. Wherever you’re driving, be diligent in observing them. Exercise common sense in deciding how fast you can go. In an empty stretch of road, you can ride up to the maximum permissible limit; however, a lower speed limit may be more appropriate in urban areas. Remember that the faster you go, the less time you have to respond to unexpected situations. Even with the motorcycle’s notoriety for being a risky form of transport, you need not be afraid of using it. By observing the suggested tips and being a responsible rider, you can look forward to safer journeys ahead.